Signs is Tedeschi Trucks Band’s sixth album, including the group's two live albums, and its first studio release in three years. 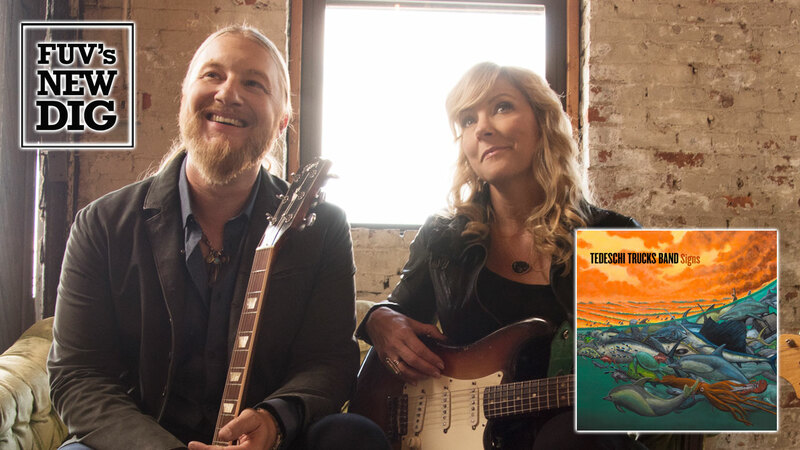 Led by singer and guitarist Susan Tedeschi and guitarist Derek Trucks, this cohesive, democratic unit of twelve members is always evolving and their latest album is a musical gumbo, rich with dashes of Southern rock, blues, soul and gospel. Each style stands perfectly aligned with the others. Unfortunately, loss played a part in the writing, recording and even the aftermath of Signs. The group was deeply affected by friends and family members who died in the years following 2016’s Let Me Get By. Trucks’s uncle, Butch Trucks, and Gregg Allman, two mainstays in the Allman Brothers Band, both passed in 2017 as did bluesman CeDell Davis and Colonel Bruce Hampton; in fact, the Tedeschi Trucks Band dedicated Signs to Hampton. The passing of musician friends and influences like Leon Russell and B.B. King also resonated with Tedeschi and Trucks. Most notably, on February 15, the very day that Signs was released, Kofi Burbridge, keyboardist, flaustist, and founding Tedeschi Trucks Band member, died at the too-young age of 57. The Bronx native, the brother of Grammy-winning bassist Oteil Burbridge of Dead and Company (and formerly Tedeschi Trucks and the Allman Brothers too), suffered a heart attack in June 2017, but was able to return to the band and play on Signs. But as Kofi's health worsened this winter, Gabe Dixon stepped in on keyboards. With so much grief hitting close to home, Signs could have been an exercise in mourning—but this is not a sorrowful album. Instead, it honors and celebrates the people who have passed with the goal of keeping their spirit alive, while nudging the band forward into the future. There've been recent lineup changes too: bassist Tim Lefebvre departed before Signs was released and Brandon Boone has replaced him. Signs begins with “Signs, High Times,” a funky showcase for the band’s vocalists: Tedeschi, Mike Mattison, Mark Rivers and Alecia Chakour. The soulful “I’m Gonna Be There,” co-written by and featuring guest Doyle Bramhall II, gives the album a dose of reassurance. “All The World,” also co-written with Bramhall, is a heartfelt ballad that addresses today's difficult times and extends a comforting hand. The progressive “Still Your Mind,” written by Trucks and Burbridge, couples Trucks's scorching lead guitar with Tedeschi’s comforting words: “Still your mind and breathe/Close your eyes and see/Fill your hands and drink with me/Be here now/Lay your troubles down." “Hard Case” is a straight soul rocker and “Shame” delivers a healthy slice of Southern rock, before sliding into a mellow groove. “Strengthen What Remains,” a pretty ballad penned by Mattison, demonstrates the most tender side of Tedeschi’s expressive voice. "What a beautiful season," she wistfully observes. "Oh, what a beautiful life.” Special guest Warren Haynes co-wrote “Walk Through This Life" and appears on the track too. “The Ending” is the album's final statement; a poignant, acoustic song written and performed by Tedeschi, Trucks and Oliver Wood of the Wood Brothers. It’s a heartfelt tribute to the memory of Allman, Davis, Russell, King, Butch Trucks and, of course, Hampton. Coming out of Jacksonville, Florida, the Tedeschi Trucks Band coalesced in 2010, following Tedeschi and Trucks own mutable journeys as musicians. After leading her own band, Tedeschi's big solo breakthrough came in 1998 with Just Won’t Burn and the following year, while on tour opening for the Allman Brothers Band, she met Trucks. In addition to playing guitar with the Allman Brothers Band (Trucks was a full-time member from 1999-2014), he founded the Derek Trucks Band in 1994, releasing a self-titled debut album in 1997. The meeting of Tedeschi and Trucks was fortuitous in so many ways: they fell in love, married, and continued their individual careers. In 2007, the couple toured together as Derek Trucks and Susan Tedeschi’s Soul Stew Revival. That good experience led them to merge their respective groups together, giving birth to the Tedeschi Trucks Band. Their first album was 2011's Revelator. Tedeschi Trucks Band is far more than a contemporary rock band carrying a torch for heroes and loved ones who are gone. They are a vital ensemble of virtuosos and genre-defying shape-shifters, capable of expressing many styles and moods. More importantly, Tedeschi, Trucks, and their bandmates understand music's infinite power to heal when facing times of strife, sadness, and instability.